This recipe might include all of my favorite things. We have cauliflower and tofu, coated in a light and crisp batter then drenched in a mouth watering homemade teriyaki sauce. It’s sticky, salty, sweet, and ultra savory. Japanese-inspired comfort food at its best that just happens to be both vegan and gluten free! You guys, we need to talk about this teriyaki sauce. It is out of this world! And couldn’t be simpler to make–5 main ingredients, then water + cornstarch to thicken. In Japan, teriyaki refers to the method of cooking rather than the sauce, specifically for meats that are grilled then glazed, typically with a variation of this sauce made with soy sauce, mirin and/or sake, and sugar. In the US, teriyaki has come to mean any food prepared with the sweet and salty sauce. I took my inspiration from the American use of teriyaki rather than Japanese, with deep fried or baked morsels of vegetable and tofu smothered in a mouth-watering teriyaki sauce. My homemade teriyaki has a fun and wholesome twist on the Japanese sauce. Instead of sugar, I used date syrup (Silan) made by Soom to sweeten the sauce. Soom Silan is a deliciously rich flavored sweetener that hits all those caramelly notes. Soom Silan is an all-natural date syrup from steamed and pressed Israeli dates. Like dates themselves, date syrup makes an excellent natural sweetener that’s full of vitamins and minerals. Silan is versatile sweetener that happens to be lower in sugar than maple syrup, honey, and molasses. 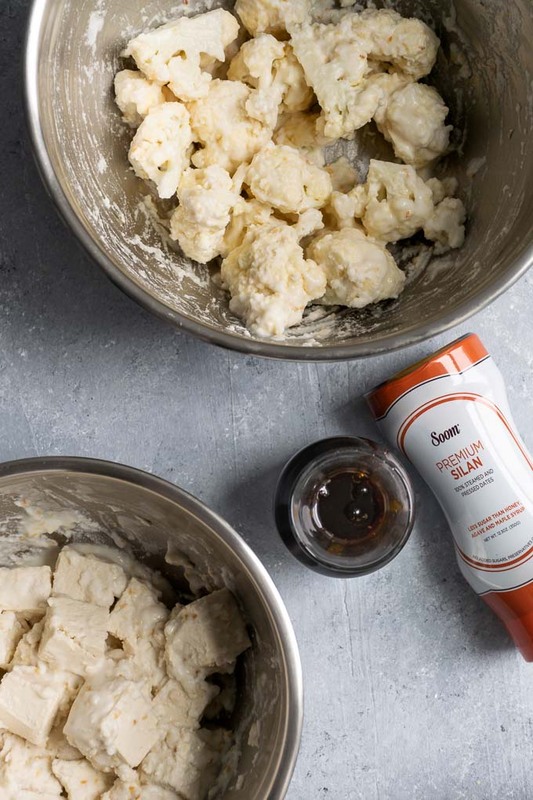 Silan might not be a traditional ingredient in teriyaki sauce, but the rich complexity of the sweetener plays beautifully with the soy sauce and mirin. This sauce is so delicious, it’s one I’ll be making regularly for quick stir fries or the most tasty of dipping sauces! The other main ingredients in the sauce are soy sauce and mirin. For the soy sauce I prefer to use tamari, which makes this a naturally gluten free recipe. Mirin is a Japanese rice wine used for cooking, it’s slightly sweet (from naturally fermented sugars) with a low-ish alcohol content (similar to wine). 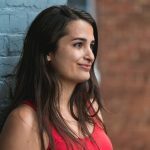 It’s sweeter than sake, though if you can’t find mirin you can substitute sake with a little extra drizzle of date syrup or use sherry or marsala wine. Soy sauce, mirin, and silan are the three main ingredients in this sauce, but I rounded out the flavors with a clove of crushed garlic and some dried and granulated onion. Whisk it all together with some water, then heat the sauce in a pot until it comes to a simmer. Make a cornstarch slurry, mixing together 1 tablespoon each of cornstarch and water and add that to the pot. In a couple of minutes the starch will activate making a thick sauce that will cling to a spoon. The sauce will thicken as it cools. 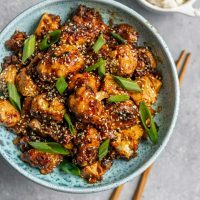 This silan teriyaki sauce takes just 5 minutes to make so it can be easily thrown together alongside the battered cauliflower and tofu, or it can be made in advance if you’re short on time. The tofu and cauliflower are coated in an 8-ingredient batter that comes together in no time, then baked or fried until crisp. The batter is made of rice flour, which fries or bakes up perfectly light and crisp and happens to be gluten free. Next add cornstarch, which helps the batter bind, and baking soda which lightens the batter when cooked. Toasted sesame seeds & toasted sesame oil are added for extra flavor and a little crunch, and salt and white pepper for seasoning. Last add water to make a thick batter. The nice thing about this rice flour batter is that it is super versatile with how it can be cooked. With no changes the cauliflower and tofu can be baked or fried. Frying produces that perfect restaurant-quality crisp, perfect for impressing guests or your own tastebuds. Baking is a bit slower but I appreciate that it’s hands off and healthier for every day eating. 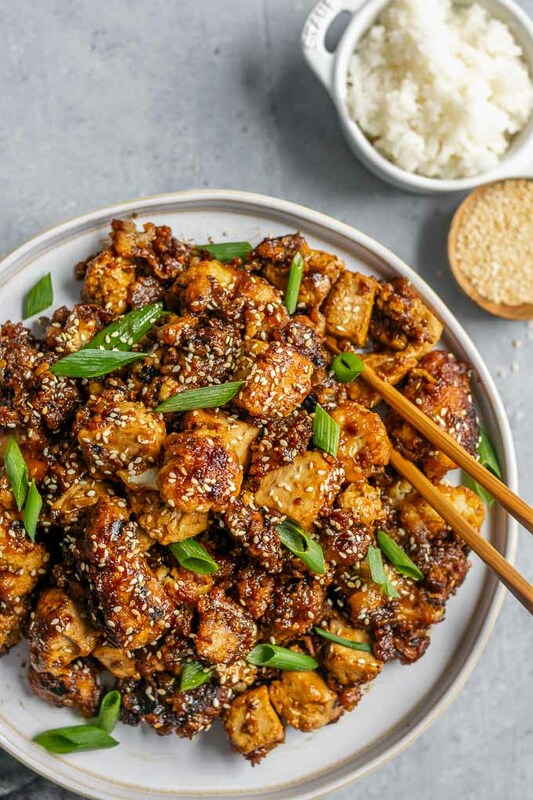 Once the cauliflower and tofu are all crisped up (either by baking or frying) toss them in the teriyaki sauce in a hot wok or skillet. After a minute or two until the sauce will thicken to coat the morsels and turn delectably sticky. 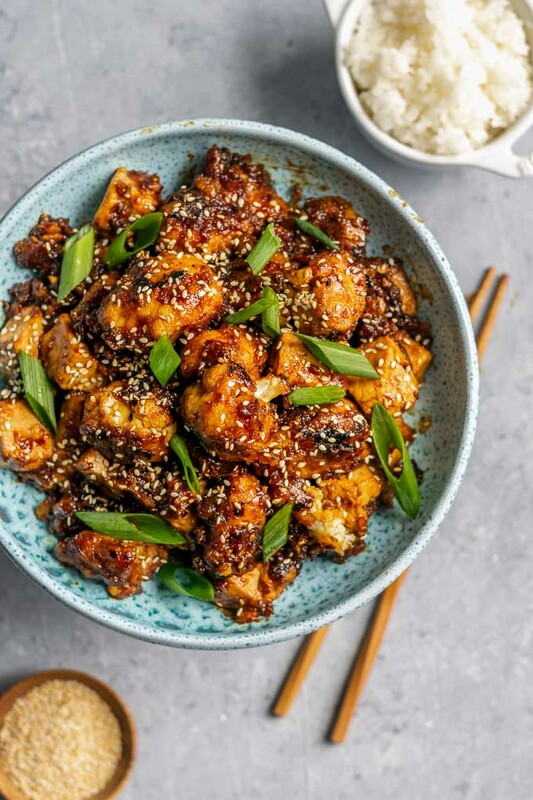 Serve immediately so the dish remains hot and crisp, sprinkled with extra toasted sesame seeds and scallion greens over some sushi rice (or jasmine rice, or whatever rice makes you happy). This sticky teriyaki tofu and cauliflower is best served immediately, leftovers admittedly lose their crispness but are still sooooo good. Like, this dish is addictively good. If you prefer an all cauliflower version, go ahead and use the entire head of cauliflower and skip the tofu. If you would rather have all tofu, halve the sauce and the rice batter. But whichever way you enjoy this tempura-reminiscent teriyaki-smothered dish, I know you’ll love it! Thank you to Soom for sponsoring this mouth-watering recipe! I’m such a fan of their sister-owned business 🙂 . 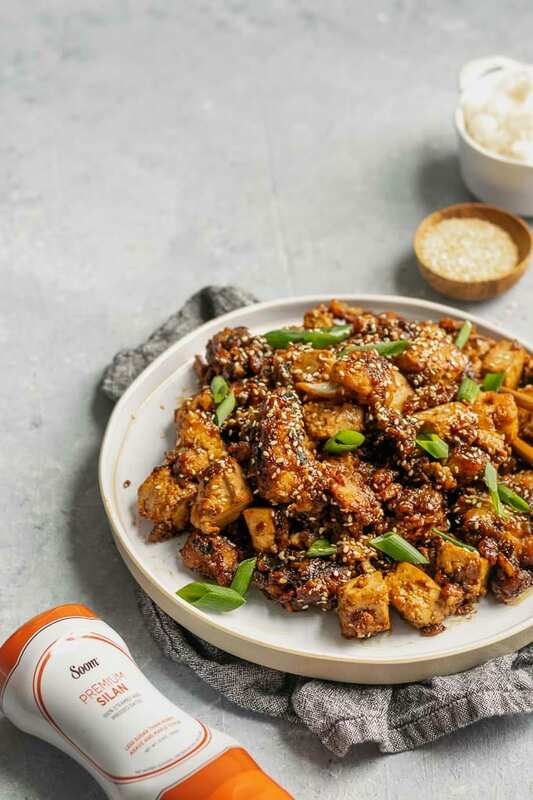 If you make this delicious sticky teriyaki tofu and cauliflower, leave a comment and give the recipe a rating on the recipe card below! Also don’t forget to share your creations with me on Instagram, tag @thecuriouschickpea and #thecuriouschickpea, I absolutely love seeing your photos! 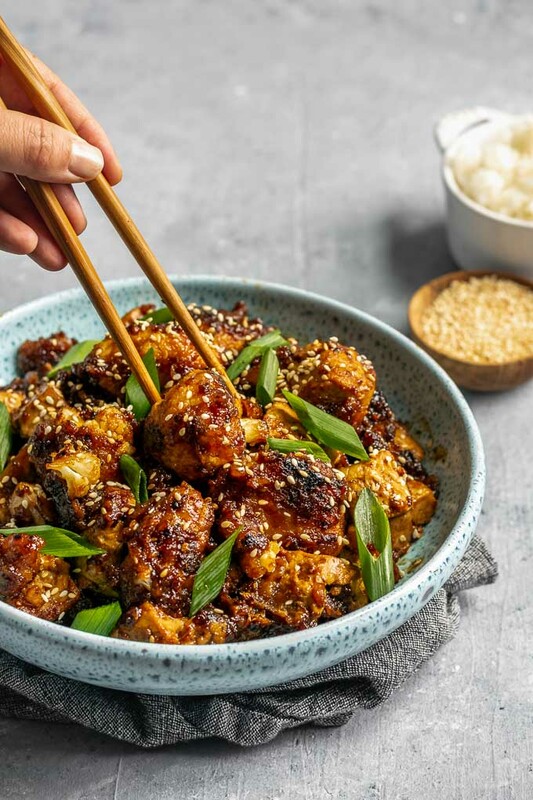 Tofu and cauliflower are battered and either baked or fried until crispy before being smothered with a sticky teriyaki sauce made with Soom Silan (date syrup). Served with some sushi rice it is a most delicious and addictive meal! Whisk together the soy sauce, Soom Silan, mirin, 1/4 cup of water, minced garlic, and onion powder. Add the mixture to a small pot and turn on med-low heat to bring to a simmer. In a small bowl whisk together the cornstarch and 1 tablespoon of water to make a slurry then add it to the sauce in the pot. Whisk to combine and let simmer for 1-2 minutes to thicken until it clings to a spoon. Turn off the heat and set aside until ready to use. Can be made in advance and stored in the fridge. In a large bowl mix together the rice flour, sesame seeds, cornstarch, baking soda, salt, white pepper, sesame oil, and water to make a thick batter. Pour half of the mixture into a second bowl. Add the cauliflower florets to one bowl and the tofu to a second bowl and gently toss to coat with the batter. If needed sprinkle on extra rice flour to thicken the batter. To deep fry: Heat a couple of inches of oil in a pan to 375 ºF, or until the oil bubbles around a piece of batter when dropped in. Fry the cauliflower and tofu in batches for about 5 minutes each batch until they turn a light golden brown and drain them on a paper towel lined plate. To bake: Pre-heat the oven to 425 ºF and arrange the cauliflower and tofu in a single layer on a parchment paper lined baking sheet. Divide across two baking sheets if necessary. Bake for 15 minutes, then flip and bake an additional 10 minutes or until the coating is crispy and golden brown in spots. Heat a skillet or wok over medium high heat. When hot, add the cauliflower and tofu and the teriyaki sauce. Cook for 1-2 minutes, stirring to coat everything in sauce. Once the sauce is thick and mostly absorbed into the cauliflower and tofu turn off the heat, add the scallion greens and serve over rice. Very tasty-non-vegan husband loved it! I think next time I’ll also bake broccoli along with the cauliflower and tofu. Nice flavor and pretty easy to put together. Omg omg, what a delicious recipe!!! Even though I was a bit concern at the beginning because the batter was too salty to my taste, it turned out perfect!! Saying that everybody loved it, is not saying enough! !